What is Apimaye Thermo beehive? Plastic beehive – sounds non-ecological and unnatural, isn’t it? But wait. 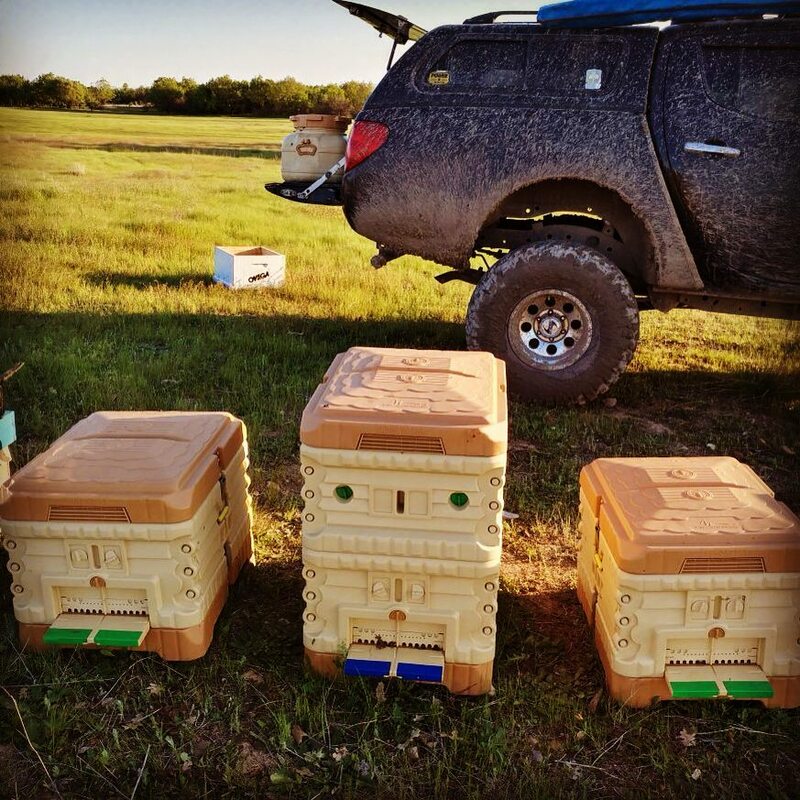 Just study it a little and you will understand that in many ways this hive is superior to standard wooden hives. 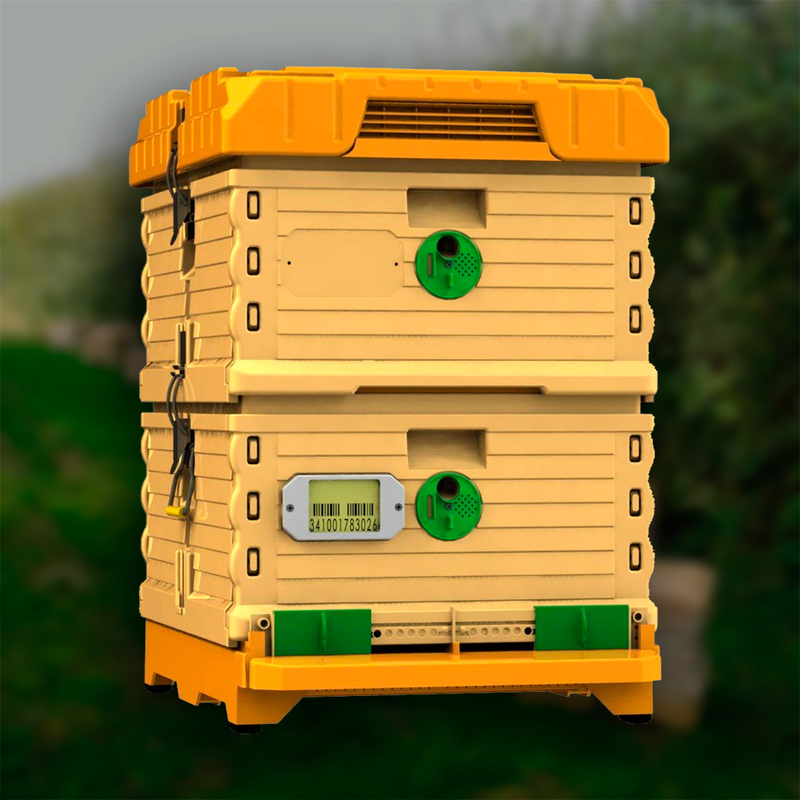 Thermo Hive, Flow Hive – progress does not stand still, even in such a conservative area as beekeeping. What are the advantages of the Thermo beehive? 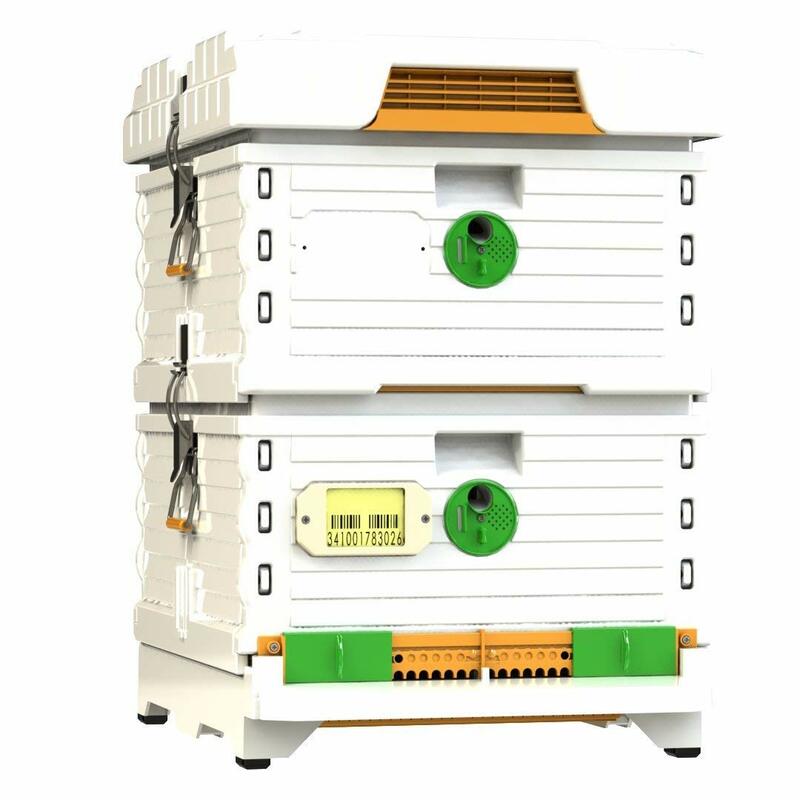 The developed module system provides healthy bee rearing. It’s easy transporting, harmless and non-disturbing hive. 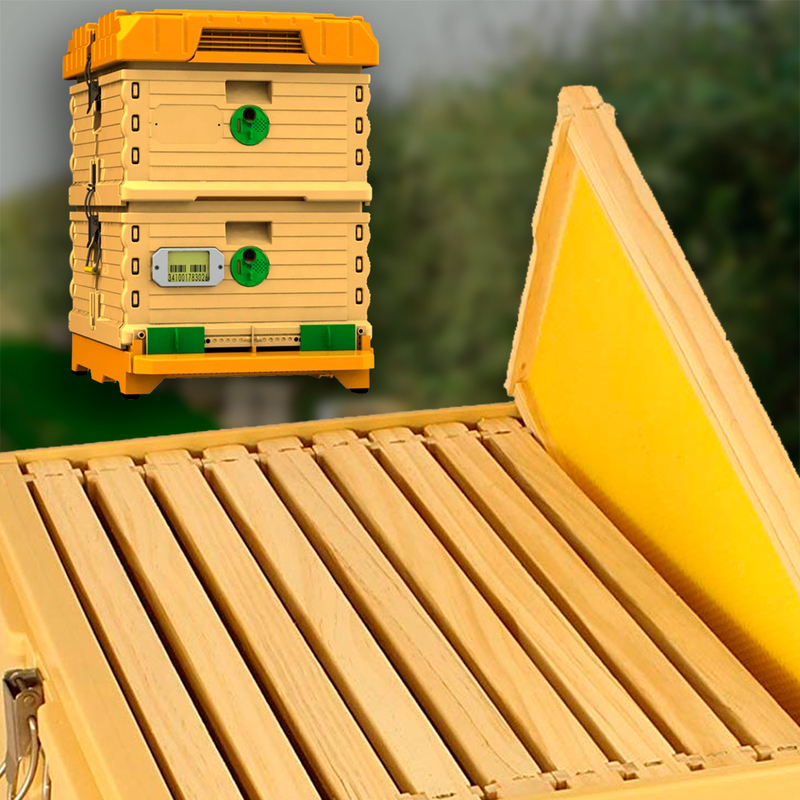 Apimaye Thermo Hives are made of certified food plastic (HDPE) over strict adherence to the Food Codex. The coloring is done directly, not externally – that is, the dye is injected into the mold. So there is no claim to asbestos for the durability of the paint and its effect on bees. provides antibacterial properties and prevents the appearance of Brood diseases. protects from UV radiation as sunlight and extend the useful life of the beehive. 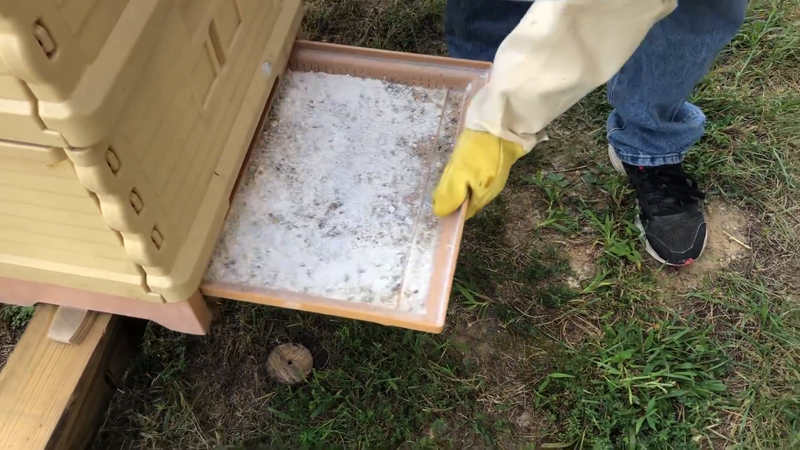 On each side of the hive part, there are 2 layers of insulation. Due to this, it is possible to keep coolness inside the hive in summer and warm in winter. 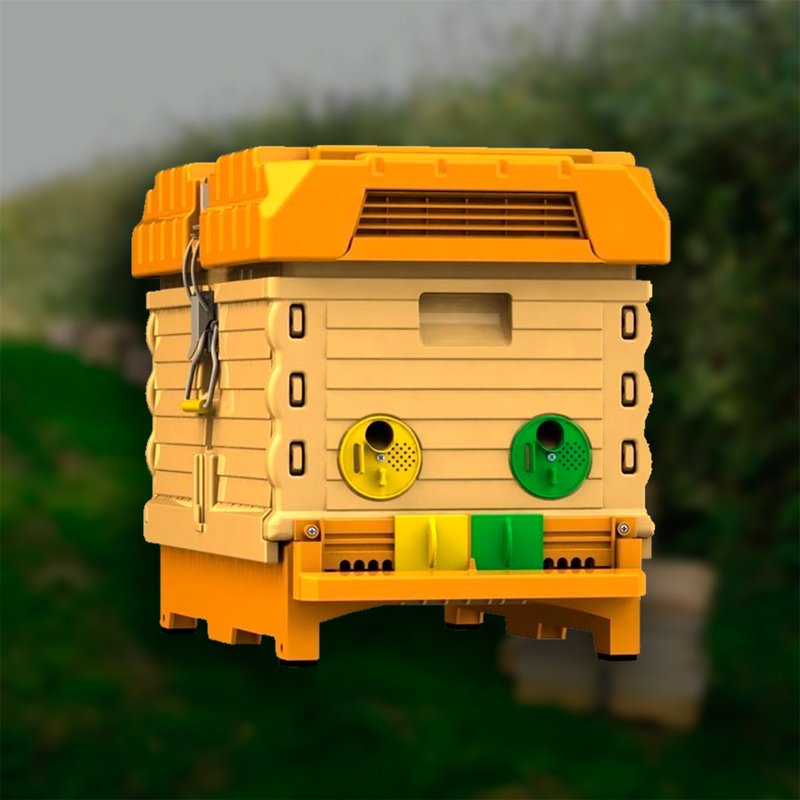 Inside the wall and the top cover (in other words, outer parts) are not hollow – they contain a special filler that provides thermal insulation and a comfortable habitat for bees, regardless of climatic conditions. Consequently, it allows the colony to survive the winter without loss. Thermo hive was designed in such a way that the air coming from the outside through the floor filters, when rising up, heats up. 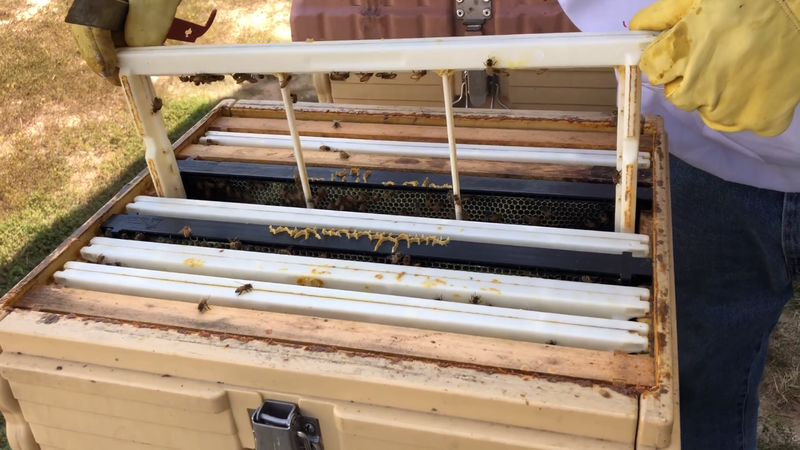 When passing through the ventilation channel, warm air comes out through the air ducts on the feeder and special louvers on the top cover of the hive. 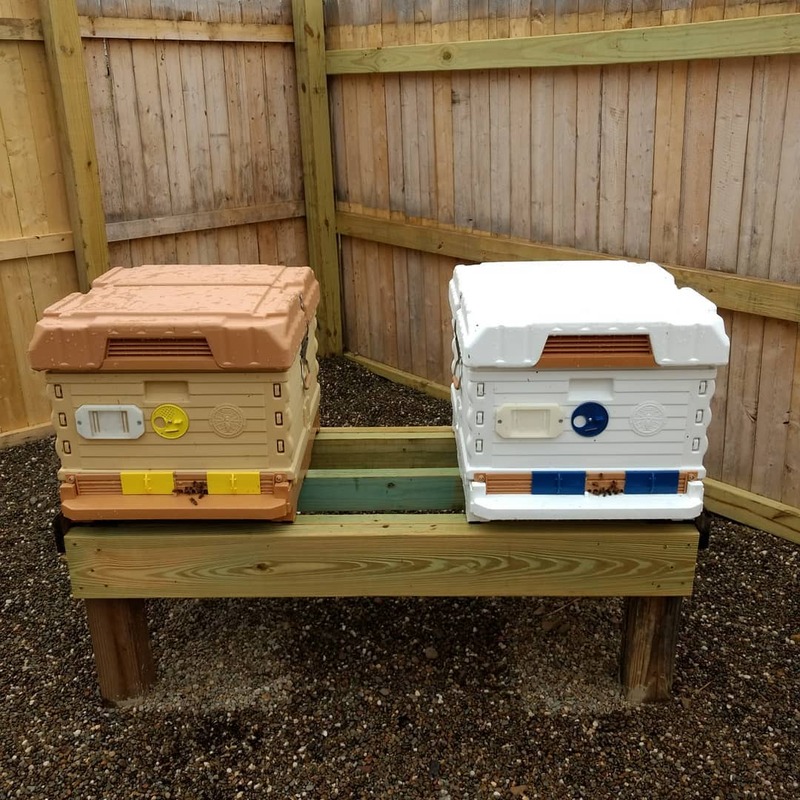 Bottom boards of the Thermo Hive have an Integrated Pest Management (IPM) system. It consists of a varroa excluder (separating grid) and drawer. Thanks to the screened bottom board with drawer, varroa falling down from the bees, can’t get back into the hive. All you need to do is clean the tray regularly. 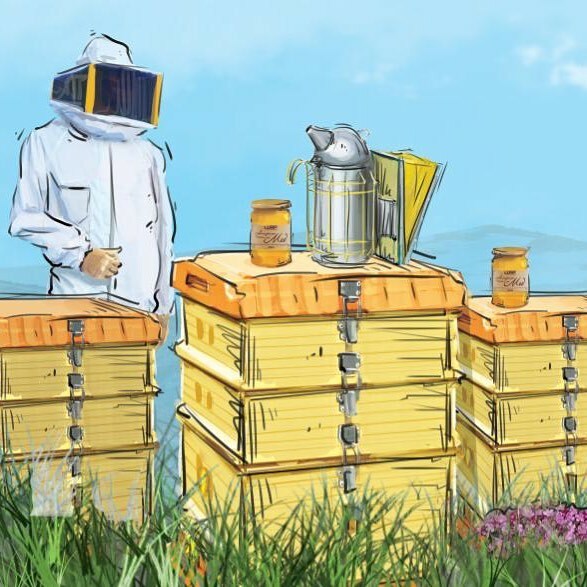 The productivity of bees increases, as they will carry out more flights for the nectar, than for nursing, respectively, the harvest of honey will be higher. 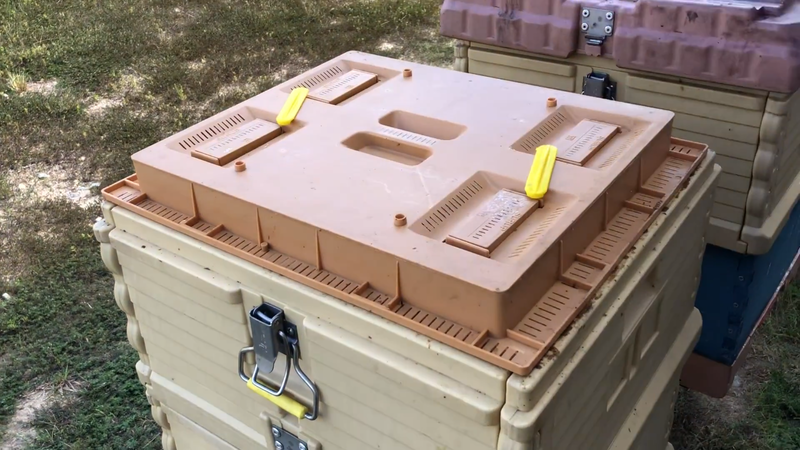 Rope grooves located at the top of the hive, allow you to securely attach the hives to the vehicle. If necessary, beehives can be fastened together as a constructor, which also differs from usual wooden beehives. This is also a distinctive design feature of a Thermo Hive. The exit for the bees is securely closed, so you can be calm – the bees will not be able to leave the hive during the transporting. And at the same time, the ventilation filters will continue to pass air, so you can not be afraid of the loss of the colony. All surfaces of the Thermo Hive can be disinfected. You can use any of the convenient ways to clean the elements – wash with a sponge using soda or other common disinfectants, or apply pressure washing. The main thing is that the water temperature does not exceed 140°F (60°C). 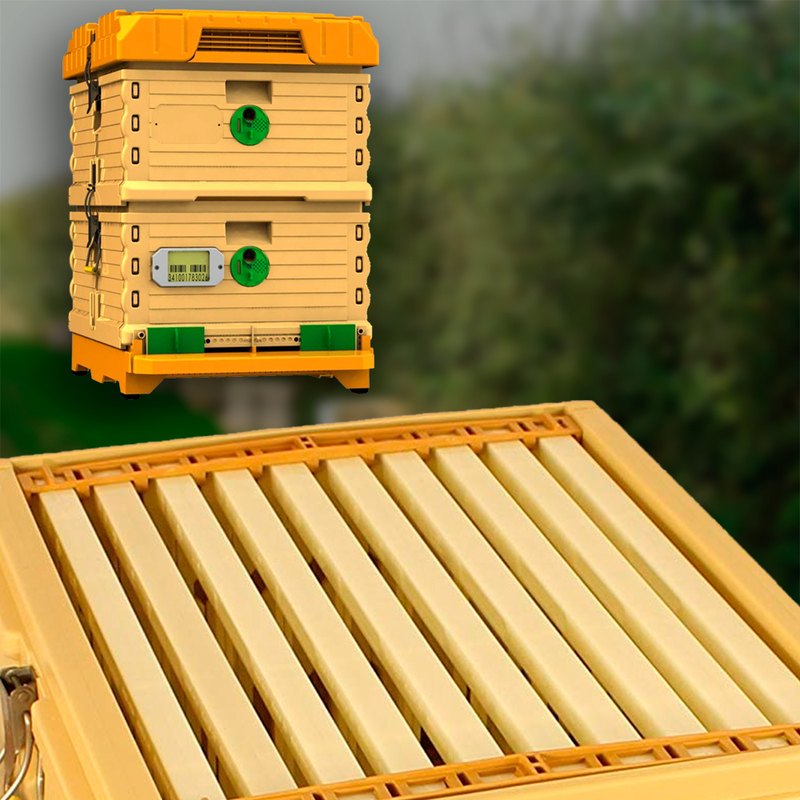 Thermo Hives are represented by the following designs – 10 frames and 7 frames. 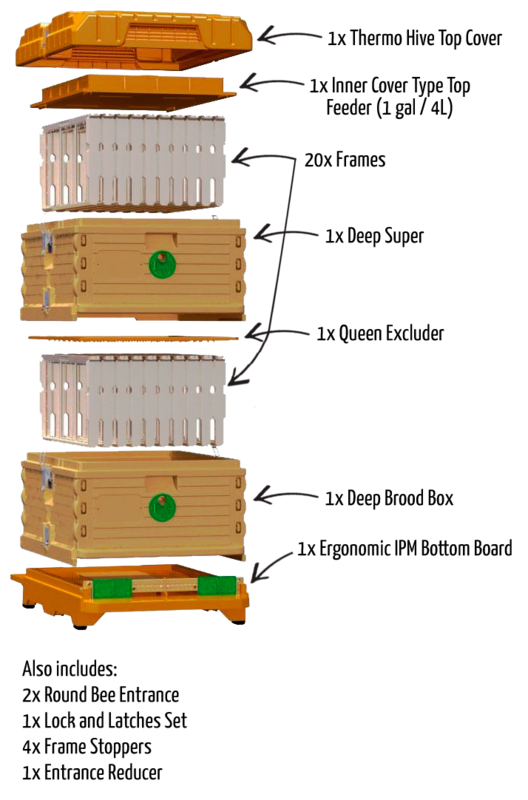 At the same time, 10 frame beehives are presented in three assemblies – without frames, with wooden frames (more expensive) and plastic (the most expensive option). Any of the bundles come in either orange or white – your choice. The price, by the way, doesn’t depend on color. What does Apimaye Thermo Hive include? So the first thing we’re going to do is we’re going to start with the top. As you can see everything is latched together so you don’t have to worry about whether it’s straight or not, about the top blowing off if it’s windy etc. I will admit this top is pretty heavy. It has two vents – one in the front and one in the back. After taking the top cover off you have your feeder inside. What Apimaye recommend is to put syrup all on the floor just enough to cover the floor. Don’t fill it up so high because you have a chance of drowning your bees that way. There are special entrances – just turn it around you can let the bees come out and get syrup. The other thing that Thermo Beehive have on is called KEK – that’s if you want to put candy in. 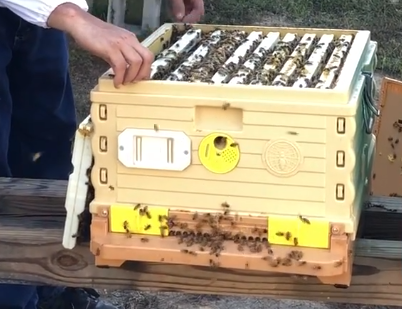 The bees can’t come out on to the trade – they can only stay within this little area. You have four of them – two on each side. You could either keep them all open or you could close up a couple on each on one side if you want. When the feeder is covered with the top, you could make your change without opening it. There are yellow holders to keep them close or if you wanted to you could change them up here without disturbing the bees in the feeder. The next thing I want to tell you about is flexible plastic frames. I do like them because you don’t have to worry about having the put foundation in or about it falling out. There are also 4 frame spacers to space the frames out to make sure that you have the correct distance between the frames. These frames come apart and what you do is you lay your foundation in. 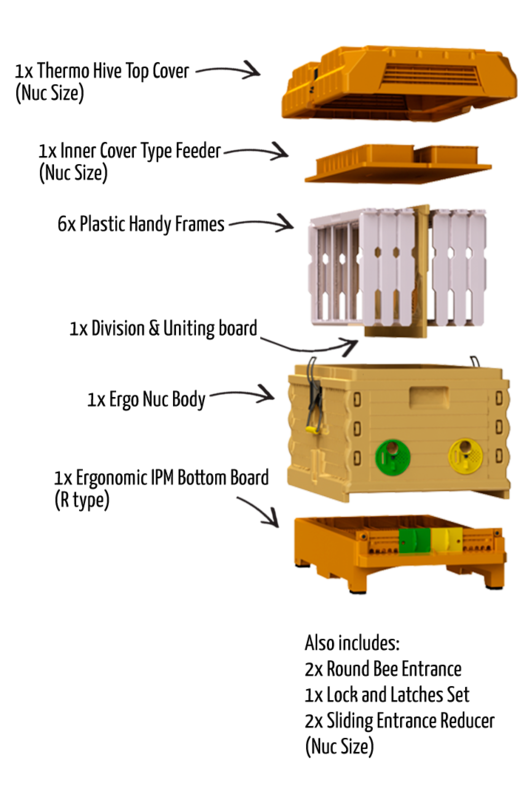 Apimaye recommends that you don’t need and don’t use wired foundation or plastic foundation – just beeswax foundation without the wires. And then when you have it in there you just snap it back together and you have your foundation ready. It really saves a handful from wiring up a frame and then putting foundation, and then sealing the foundation to the wires – this really takes care of that issue. This is a deep super. Of course, it has an entrance where you can let the bees in and out or you could just use it for ventilation. The big hole will be able to let a drone out, the smaller one should be able to let the bees out. My advice – I would just keep it on ventilation. After deep super, the first thing you come in contact with is the queen excluder. Everything sets in so none of the boxes will end up out of place. Next is the deep brood box. This is something I want to talk about because this actually has a lot of features in it. So, front entrance. You have these sliding doors which will open the entrance to a lot of bees get out. If you wanted to reduce your entrance only you have to do is close it as much as you want. Of course, you probably want to do that during the wintertime, so it’ll stay nice and warm in the Thermo Hive. Also, there are two holes on either side, they will let the drones out. Round entrance is where bees can go in out and it is big enough for the queen to get out. So if you have a queen that wanted to go mate she could get out that hole and come back in. Of course, there is an entrance for the bees and then if you wanted to you just ventilate it. Now let’s talk about what we have in the back. You do have a screen bottom board. This tray is for collecting pollen. So you put the tray in and you have pollen trap right here and your pollen trap goes in. 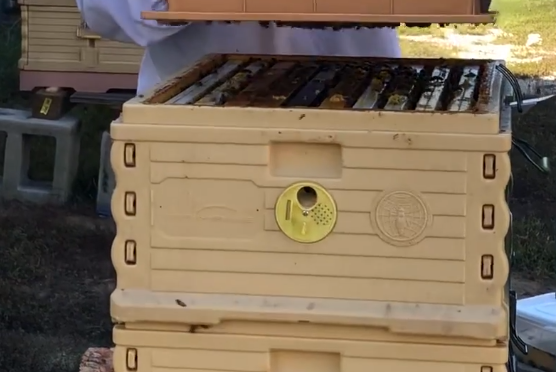 If you don’t want to collect pollen but you don’t want to remove the trap you would just pull it out and had a lot of the bees to go in and hide without dropping their pollen. If you had to remove the pollen trap you have a special red plug that will seal up that hole and it just snaps in there. The best thing I want to talk about this hive is that you can actually use it while you’re working as a temporary nucleus hive. Thermo hive completed with separator board, that actually fits in. It doesn’t go all the way down because if you’re going to use it that way you have to remove the pollen trap. 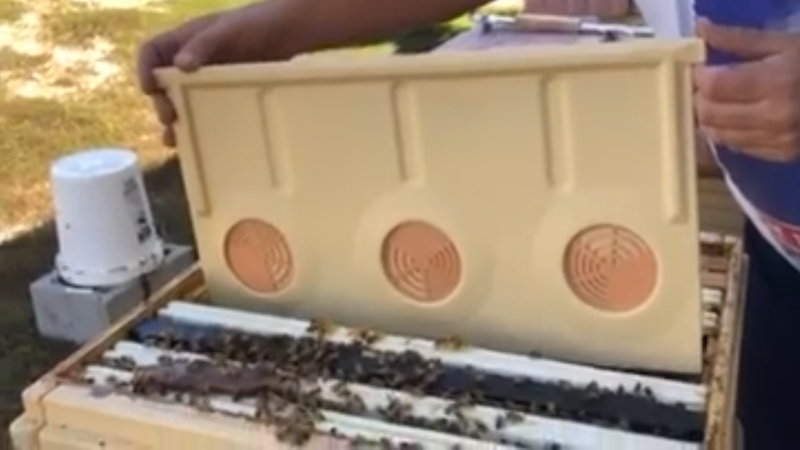 Separation board has three openings and on each of opening, it has where the bees can go in out and also it works as ventilation. You can turn it to that the bees on one side can’t see the bees on the other. 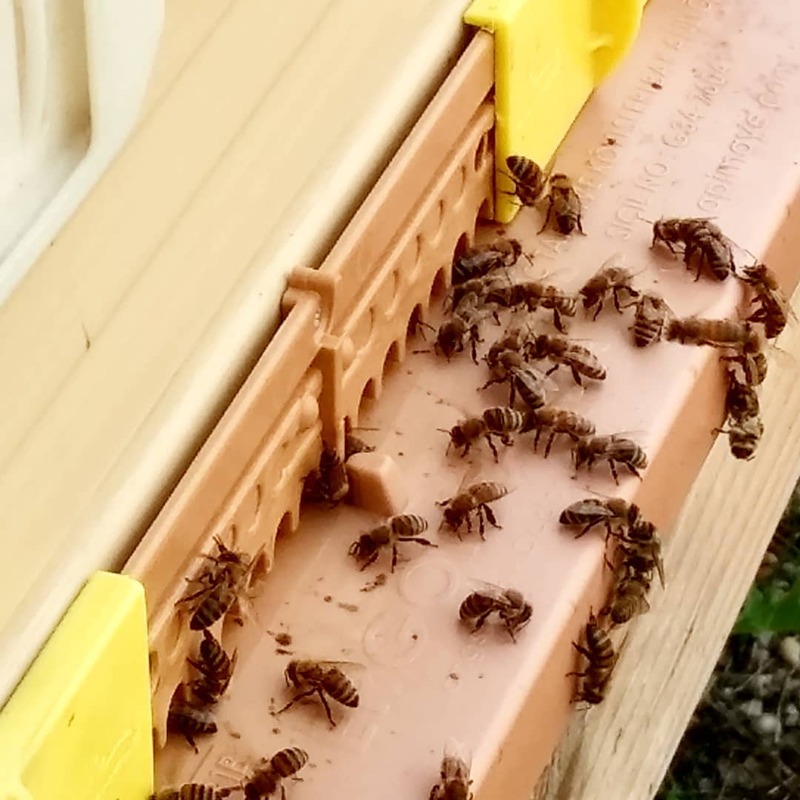 This is a perfect example if you want to raise queens because you can take a clean frame and place it in with other frames and use it as a temporary nuc. This way bees have everything they’re going to need. 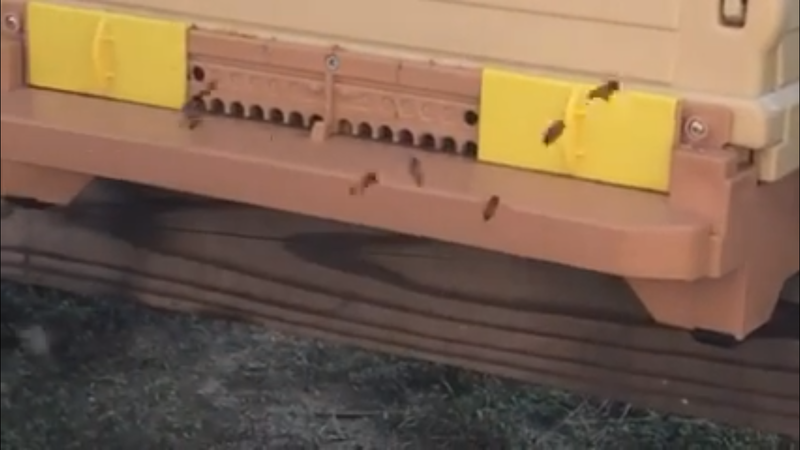 You can close off the one end, if you want to feed bees separately you just open up one side of the feeder and let these bees get the syrup. So the bees from the other side can’t come over to another side. I still think that this was a brilliant idea. You close up the second side so these bees can’t get out and then the bees on the other side can come and go as they please. 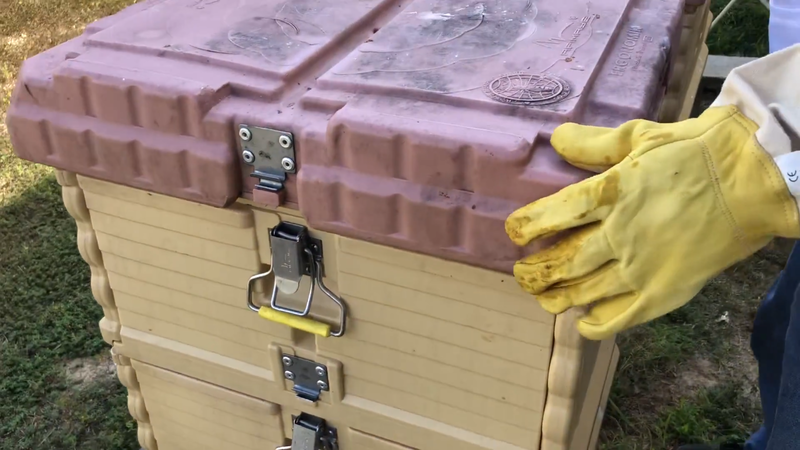 The only downfall I see on this is that Thermo Hive has a little door that opened and you could put a vent, so you could keep the entrance dry away from wind and rain. And these could hang out – they just have the landing board but no way to protect bees. Unless you wanted to close doors up or if you want to just keep one entrance on each side open that’s something to think about but that’s totally up to you. Overall I do like this hive. I think Thermo Beehive is going to go to the places where it gets extremely cold – for example, north, Alaska. Thermo Hive has good ventilation and it’s made to keep warm in the winter and cool in the summer. I’m not gonna say this was cheap but I believe it’s going to be well worth it because it’s a few things that are going to happen in the winter time and you’re probably not going to lose your bees. It may cut down on diseases but it’s certainly going to keep your bees in a hive in the winter because it’s supposed to stay warm in the winter even in extreme temperatures. Don’t eat less honey they won’t need that much food to survive.